<p>We are family owned and conveniently located on the main street in Derry at 15 West Broadway, next to the Opera House. There is plenty of easy parking out front or in the lot next to our building. We deliver to most Southern NH towns in our own vans. Charges typically range from $8 to $11. Please try us! *Our shop is open from 8:30am to 5:00pm give or take a few minutes, Monday through Friday. Saturdays we are open from 9:00am to 3:00pm We are open later during holiday seasons, or by request. Sundays we are open by appointment only. Our shop is closed for the following holidays: Thanksgiving Day, Christmas, New Year’s Day, Independence Day and Labor Day. We delivery daily to Derry, Londonderry, Windham, Chester, Hampstead, Auburn, Manchester and Salem. Delivery charges range from $8 to $12. 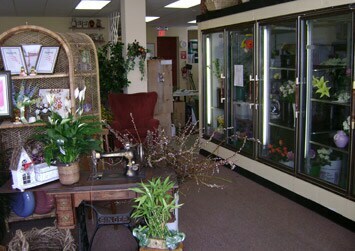 We offer same day delivery throughout NH and North America through our Teleflora partner florists. There is no additional charge for this service (unlike the 1-800 web order gatherers who charge a $12 to $20 service charge). Gifts Baskets, Candles, Ballons, etc. Hand crafted pottery, glass and metal works. Premium fruit, gourmet and or wine gift baskets made to order, typically $30. to $150. Wide selection of scented candles including locally made soy candles . Latex and Mylar Balloons, Balloon Bouquets for all occasions. For questions, floral guidance, or for more information, please contact us by calling us directly at (603)432-2371. We're always here to serve you and make your experience a pleasure.